Treats! Tricks! And Oh Yeah…Happy Birthday to Me…it’s #DoubleFMLoween! – #DoubleFML FatDarrellPalooza! Treats! Tricks! And Oh Yeah…Happy Birthday to Me…it’s #DoubleFMLoween! Man, Fall is not messing around huh? It just kicked the door in like “BOOM Bish! I’m here!” Geez, it’s freezing outside. With that said, shoutout to my 15-year old nephew DJ whose hoodie I hijacked for the featured photos. Anyway…Boo! …And Happy Halloween everybody! As regular readers may already know, this is one of my favorite days of the year (in case you missed the post where I proposed a second Halloween in May as well, check it out by clicking here) so I’m obviously excited! Why do I love this day so much? Well, as I prove nearly every week with this blog, it’s always fun dressing up like an idiot (see the various photos that accompany this post for further proof). But I also love seeing how creative people can be and what they select as their alter ego. And sure, Halloween has gotten a bad rap over the years because some people think that the day is literally worshiping evil but come on, you fuddy-duddy, that’s a bit misguided, don’t you think? As I’ve asked before, do you really think that the 6-year-old girl in the Wonder Woman costume is going to wrap up her night of trick-or-treating by drawing a 5-pointed star and making a blood sacrifice? Give me a break, she just wants a Kit-Kat bar (<- see what I did there? ), not your soul! Relax, it isn’t that serious. Oh yeah, and he also carved this pumpkin (with the help of his mom of course)! I always call him my mini-me but apparently that’s more than just a saying because…well look! This costume is one of many that I just randomly have lying around my apartment because, EVERY day is Halloween in my world… (speaking of costumes, check out these foodie costumes from a few posts ago by clicking here). Despite him living several states away, he really acts a lot like me. Hopefully that changes soon though or my brother and sister-in-law should be absolutely terrified! One of “me” is definitely more than enough! I may have to fly up to Virginia to take him trick-or-treating next year though. That would be fun. Oh yeah, speaking of trick-or-treating, check out this meme that’s been going around on social media lately. It’s both hilarious and surprisingly accurate! I already did a full breakdown of my candy hoarding strategy in the Candy Cartel post so I won’t rehash all of that here. However, just like the meme said, there were certain “go-to” houses that were the true MVP’s. For example, this one house gave out full-sized candy bars (yes)! Another gave out coupons for a free sundae at McDonald’s (even better)! One guy gave out dollar bills (awesome)! And this other lady made these incredible homemade popcorn balls that I technically wasn’t allowed to eat since my mother said I couldn’t have anything that wasn’t prepackaged….so I always scarfed it down on the way home before she could see it (#yolo). The lame houses? Well, this one guy always gave out pennies. He used to always say, “put that toward your college fund” as he tossed them into the bag. Really dude? College? With twenty pennies? Hmm, apparently, he didn’t expect me to get into a very good school! Sure, it was a far step down from the dollar bills the other house was giving out but hey, money is money, so I actually didn’t mind this too much…although most of the other kids hated it. What was annoying however, was when some psychopath would give out loose candy corn, unwrapped peppermints and things like that…actually, anything unwrapped sucked; especially since it would always end up sticking to the pennies and everything else inside of the bag. Now THAT was annoying. I remember getting circus peanuts a few times too (the disgusting candy, not actual peanuts) – those were always nasty. Oh yeah, and the houses that put random stuff in Ziploc bags (like Doritos, homemade jerky or baby carrots) were weird too…. although prepackaged chips were always welcomed. All in all though, I never really had any complaints except for the one year my neighbor turned off all of her lights after I rung the bell! She apparently wasn’t as stealth as she though because I saw her crawl across the living room floor and hide behind her couch through the window. Not cool lady! Anyway, what was/is your favorite and least favorite Halloween candy? Comment below! So, regular readers may also know that aside from Halloween, October 31 is also my birthday. Thanks to all who have sent emails, texts and social media posts wishing me well. That was very sweet and kind of you, I really appreciate it! I’m starting to get a few too many candles on my cake lately though, but I suppose that growing older still beats the alternative, right? So, I’ll take it! I’ve actually had a few people ask me if I like having my birthday on Halloween. Their thought process was that since people are already celebrating something else, the day is never just about me. I suppose I can see their logic, but I still think it’s one of the best birthdays on the calendar! Everyone is already excited, dressed up in fun costumes and there’s chocolate everywhere! What’s not to love? “Happy Christmas!” Here’s your one present to cover both events! And on that day, everyone else gets a present too so you definitely run the risk of missing out with a birthday in late December. Gifts aren’t normally exchanged on Halloween though so basically, I take a day that’s already great and make it even greater with cake and presents. Again, what’s not to love? Obviously, you can’t pick when you’re born (if I could, I still would have picked Halloween though…and if you’re wondering, my backup choice would have been April Fools Day) but it does always baffle me when people get married on their birthday or a day like Christmas for example. Your anniversary is a “holiday” that you can literally place anywhere on the calendar, why not space it out? Oh yeah, speaking of weddings, get this! So, aside from my parents asking me when I’m finally going to get hitched, my little nephew has now joined in with the questioning! I’m not sure if he got that from my brother and sister-in-law or if he just wants an excuse to eat cake and dance at the reception but my answer to all of them is that I’ll be getting married on Neverary 32nd, 3088. Save the date! I’m just kidding of course. I’m not opposed to getting married and possibly starting a family if the right woman comes along but if you read my Bae Watch post, you’ll know that I tend to attract a special brand of crazy (or perhaps I make them that way but whichever way you slice it, it’s not good folks!). And since I’ll be the one who will actually have to spend the rest of my life with this chick, I’m not rushing any old basket-case down the aisle just so everyone can eat pot stickers and drink free booze for a few hours! I have admittedly been pretty lazy with dating this year though so perhaps I should devote more time to looking for “the one” (gag lol). So okay fine, maybe we’ll move the date to 3087 instead… we shall see. I saw an interesting post the other day though. This woman said that she should start exclusively dating pizza delivery drivers because they have a job, a car and constant access to pizza. Hmm…she does make a good point! Actually, my friend Maura and I were supposed to have gotten married to each other if we weren’t married to anyone else by the time we were 30 (My Best Friend’s Wedding style…if you haven’t seen the movie, rent it) but then when we actually hit 30, we pushed the age back to 50 due to timing, logistics and you know, a crippling fear of commitment (lol just kidding! Wait…am I?). I’m sure we’ll push it back again if we get close to 50 though so yeah, 3087 still seems like a safe target. Anyway, you know who couldn’t care less about your birthday? Georgia. More specifically, Georgia’s Department of Motor Vehicles. Nope, Georgia DMV doesn’t give a damn! Seriously, what is this crap putting the registration renewal payment on my birthday every year? I mean, yeah, I get it, it’s easier for paperwork and normally that wouldn’t be a big deal but my car is starting to get a lot of candles on its cake too! So, in order for it to pass the emissions test, I’ve had to pay for an expensive repair right before my birthday these past 2 years! Couldn’t we do this on my half-birthday or something instead? Seriously, hit me up in April around tax time. I expect to be hosed over then but my birthday is supposed to be a somewhat joyous occasion. Stop ruining my life Georgia! The funniest part is that most states have started shifting toward only requiring emissions now. I remember back in New Jersey; a full inspection was required to renew your registration. These days, it doesn’t matter if your car has breaks, lights or a door for that matter so long as it doesn’t blow too much carbon monoxide you’re good to go! Seems logical eh? Aside from the expensive repair (and then a random follow-up repair that came out of nowhere….I swear, I must not have forwarded a few chain letters or broken a mirror, it’s been a long, expensive week so far! ), cost of the emissions test and registration fee, I also had to renew my license this year. I’m not sure if it’s standard practice down here but they put my full middle name on my license. So, while in Jersey, I had a professional sounding Darrell W. Butler on my ID, they’ve got me walking around here with Darrell Wayne Butler on my card! Don’t get me wrong, I love my middle name…especially since I’m a huge Batman fan (if you didn’t know, Batman’s alter ego is Bruce Wayne)! “Darrell Wayne” by itself though sounds like I’m walking around barefoot wearing overalls and a straw hat while chewing “tobaccy” with Billy Bob and Bessie Sue or something. Yee Haw! So, um yeah, Happy Birthday to me and thanks for nothing Georgia! So, here’s a little Halloween Show and Tell for you! I may have mentioned that I have an electric chair in my home office before and most people think that I’m kidding… but nope, here it is! Don’t worry, it’s not real! It’s just a prop that I used for a short film that I wrote, produced and starred in a few years ago. I had it custom built and it’s a pretty awesome replica so there was no way that I was going to just get rid of it afterwards so, there it is. Next year I should set it up in various places and allow people to take Halloween themed pics with it. I could probably at least make enough to cover next year’s emissions test… again, thanks for nothing Georgia! Oh yeah, and before we move on, check out this incredible BEAST tank top! The cutouts on the side are a bit revealing though so make sure you’re feeling confident before you decide to wear this to the gym! With that said, it’s still pretty awesome. So, if you read my “Scalding hot cup of McNasty” post, you’ll know that I’m not the biggest coffee fan (aside from my beloved Chestnut Praline holiday flavor that I hope returns soon…). However, I was feeling festive when I passed the Starbucks location in my grocery store so I decided to give this limited edition Zombie Frappuccino a try! The Starbucks equivalent to a “medium” (aka a Tall) will set you back $5 bucks but that’s pretty standard there. I have to say that the blend looks really cool though! It really does look Halloweenish (I first typed Halloweenie but that didn’t feel right…) – like something Frankenstein himself might drink. Ice, Milk, Crème Frappuccino Syrup [Water, Sugar, Salt, Natural And Artificial Flavor, Xanthan Gum, Potassium Sorbate, Citric Acid], Zombie Mocha Drizzle [Mocha Sauce (Water, Sugar, Cocoa Processed With Alkali, Vanillin), Pink Powder (Dextrose, Fruit And Vegetable Color [Apple, Cherry, Radish, Sweet Potato])], Green Caramel Apple Powder [Dextrose, Fruit And Vegetable Color (Spirulina, Turmeric), Natural Flavors, Citric Acid]. So how does it taste? Hmm, let’s see how do I describe this? Okay, have you ever had a Tootsie Pop before (another trick-or-treat candy staple…)? Not a Tootsie Roll of taffy but the lollipop version? Cherry flavored; to be more specific? If so, then do you know the taste you get when you finally reach the center and you taste chocolate but also still taste the candy residue? For those of you who are still following this analogy, THAT is exactly what this Zombie Frappuccino tastes like…but in liquid form. Whether that’s a good or bad thing depends on your individual taste. I’d much rather just have the Tootsie Pop. I was smart to get a “medium” because as predicted, the artificial sweetness of this concoction made me tap out after 3 sips. That was more than enough for me but as mentioned, I’m not the biggest coffee fan in the world so the odds were already stacked against me liking this to begin with. Do you have a food item or a restaurant that we should all try? How about a killer recipe? Tell us in the comments below and be sure to join our Facebook foodie group “Phenomnomnomenal” by clicking here! Speaking of Tootsie Rolls, those and Twizzlers happen to be a few of the Halloween candy selections that have less sugar than the rest. Unfortunately, they’re not the most popular so if you do spring for the good stuff and have a ton left over, many outlets collect candy donations to send to our active military troops which is an awesome cause. And while it might be easy for parents to part with their candy stash (in theory), kids might be a trickier story. Do you have a fitness question you’d like to ask or an accomplishment you’d like to share? Tell us in the comments below! Do you have another song that fits today’s theme? How about a song that doesn’t fit today’s themes but it so great we should check it out anyway? Tell us about it in the comments below! Okay, again, thank you for the kind words that many of you have sent for my birthday. I genuinely appreciate you taking the time out of your day and for thinking of me. I also genuinely appreciate you dropping a comment below before you leave (you knew that was coming didn’t you)? Come on, it’s my birthday! Do it! And also, don’t forget to follow me on social media by clicking the appropriate icons on the side panel. Also feel free to DM me some of your crazy costumes if you want to share any fun photos of you or your kids. Since Halloween has officially arrived, all of you Christmas Countdown psychos can now justifiably start decorating I suppose. But please keep the carols to a minimum until after Thanksgiving! For those of you paying attention to The World Series, since a base was stolen during the first game, Taco Bell will be giving away a free Doritos Loco taco between 2 and 6pm on November 1. And the 3rd is also National Sandwich Day so several shops including Subway will be giving away goodies to celebrate that as well. Speaking of Sandwiches, you can read more about the sandwich named as Best In the Nation (aka my namesake ®Fat Darrell Sandwich) by checking out this post that highlight the top 10 moments in the history of the sandwich by following this link. Previous Post To Helen Back: Guten Tag from Oktoberfest! HAPPY BIRTHDAY!!! I really enjoyed reading this captivating post! I am beginning to see that your little nephew Dom is definitely a “lot like you” lol. Love those costumes. I am sure that the two of you will have an awesome time trick or treating in the future. Good fun and candy eating time. haha. Ha, yes, Dom is a lot like me which is scary for his future! Next year I’ll definitely have to go see him on Halloween but based on the pics I’ve seen, he did pretty well Trick-or-treating on his own this year as well! Thanks for the Birthday wishes I appreciate that! This halloween birthday was made for you!!!! Good timing by your parents lol. Thanks for sharing your hilarious trick or treat experiences while growing up. I enjoyed all of the memes and pics. So glad your enjoy writing your posts because they are so entertaining and informative!!. How to you find time? Keep up the good work!!!!!!! Ha, yeah, my parents did have some good timing. My brother was also born 10 days earlier (different years) so I’m not sure what was going on in January but apparently they really like that month! Thanks for the comments! Love those memes and pics!!!. I see that my favorite Halloween candy (snickers) made “The Legend list as judged by kids. As a matter fact, it is my favorite candy of all times. Yummy!!! What are you riding? Some of your costumes are “out of this world!” Your beast tank top is awesome!!! Nice muscles to go with it!! lol Happy Birthday!!!! Yes, Snickers are awesome so you have great taste, I sure the kids who came to your house appreciate that! That’s a T-rex but it has a hole in it so I’m definitely contacting that company today! They’ve got some ‘splaining to do! Happy birthday to you. Hope you have many, many more!!!!!. Great post!! I am still laughing…..I never heard about the switch witch idea, but I love it! I wish I had known about it when my kids were growing up. Great way to get rid of the candy without a big tantrum by the kids. Thank yo u for the birthday wishes! Yes, if you know any households with kids, Switch Witch is a great idea. It just came around last year but has been growing in popularity since then! Pingback: This One is for the Birds… – #DoubleFML FatDarrellPalooza! Pingback: It’s Beginning to Cost a lot Like Christmas – #DoubleFML FatDarrellPalooza! Pingback: Hey Yo, Peep This! – #DoubleFML FatDarrellPalooza! Pingback: Puff Daddy – #DoubleFML FatDarrellPalooza! 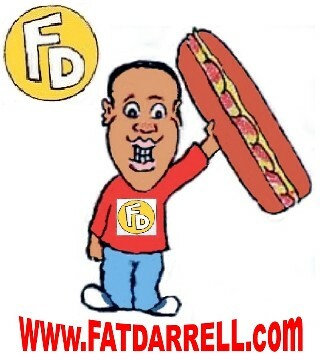 Pingback: The Fresh Prince of Alpharetta – #DoubleFML FatDarrellPalooza! Pingback: This ISH Is Bananas! – #DoubleFML FatDarrellPalooza! Pingback: Chicken Nugget Wasted – #DoubleFML FatDarrellPalooza!